It’s Senator Al Franken – It’s NOT Saturday Night Live ! After weeks of Minnesota recount wrangling over the close contest between Republican Senator Norm Coleman and Democratic-Farmer-Labor Party challenger Al Franken, the state canvassing board has certified Franken as the winner. 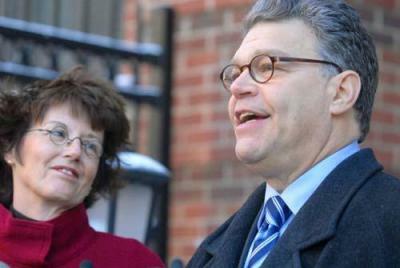 The canvassing board decision came Monday afternoon, after a final review of the tally, put Franken ahead by 225 votes. The formal issuance of a certificate of election will not come for at least a week — perhaps longer — as legal challenges are sorted out. That’s a surprisingly solid margin, after weeks of seeing the divide between the contenders narrow to single and double digits. Franken finished the recount process with a dramatic boost in the final review of absentee ballots. Coleman is vowing to delay the inevitable, however. But it is hard to pin the “artificial” tag on a lead certified by the blue-ribbon canvassing board–which is made up of Secretary of State Mark Ritchie and a panel of veteran jurists from varying political and ideological backgrounds. That hasn’t stopped Texas Senator John Cornyn, a hyper-partisan Republican, from threatening to try and block the seating of Franken with a filibuster. And Democrats will probably decide to let the court battles play out before moving to seat Franken, thus avoiding this particular partisan conflict in this first week of the new Congress. The likely delay in Washington keeps faith with Minnesota law, which specifies that a formal certificate of election cannot be issued until all legal disputes related to a contest are resolved. The Coleman camp has seven days in which to file formal paperwork contesting the election result. If they do so, as is likely, a three-judge panel appointed by Minnesota Chief Justice Eric Magnuson will have to review and resolve the lingering dispute before an election certificate can be issued. Coleman’s lawyers put on a brave face Monday. “We will not stop now,” Knaak announced. Bottom line: We appear to have reached a turning-point day for Al Franken and Senate Democrats. Franken is not a senator yet, but the prospect that he will eventually claim the seat once held by his friend Paul Wellstone is now far greater than the prospect that Coleman will retain it. For those like Franken (and this writer) who watched with frustration over six years as Coleman compiled a record diametrically opposite that of Wellstone, the canvassing board’s decision represents a very satisfying result, for Minnesota and America. The Minnesota Supreme Court issued an order late Monday morning (pdf) denying an emergency motion from the Norm Coleman campaign to stop the State Canvassing Board from certifying the vote in the statewide Senate recount. That clears the way for the canvassing board to certify this afternoon that Al Franken received the most votes in the Nov. 4 election as determined by the recount that followed. Only “obvious errors in the counting or recording of the votes” that all sides could agree on, the court said, should be fixed in the recount that the canvassing board will certify today. All other disputes belong in a court action called an election contest that either side may file within seven days of certification. That reasoning goes some way to explain an aspect of the court’s Dec. 18 ruling (pdf) that has since been roundly criticized: a provision allowing the Franken and Coleman campaigns to remove from the recount even those absentee ballots that election officials decide should have been included on Election Day. The order today carried the signature of Associate Justice Alan Page — who was first in line to criticize the court’s Dec. 18 order with a blistering dissent. As with earlier recount issues, the two members of the court who are currently serving on the State Canvassing Board — Chief Justice Eric Magnuson and Associate Justice G. Barry Anderson — did not take part in considering or deciding the question. All legal filings before the court related to the recount are available online. Chris Steller is a reporter for TWI’s sister site, The Minnesota Independent. Older Article: Peace is Restored to Ocean Beach!